When the EverStone-System was first developed, we knew that our top priority would always be Customer Satisfaction. We have upheld that “top priority” by taking extensive measures to produce the highest-quality, eco-friendly, stone & epoxy flooring system available today. Our system was designed by first identifying any weak points that a stone & epoxy floor could have and then developing solutions that would reinforce and protect those areas from potential damage. Next, we contracted with a National Epoxy Coatings Manufacturer that has been formulating high-strength epoxy coatings for over 70 years. After meticulous research, development and testing, we were able to produce a proprietary 100% Solids, High-Strength, Water-Clear, Epoxy System that is V.O.C. compliant and even meets California’s strict C.A.R.B. standards, A.S.T.M. D-2697. For even more strength, gloss retention, adhesion and durability, we increased the ratio of epoxy-to-stone. Our ratio is over 1-1/2 gallons of 100% Solids epoxy per 200 pounds of stone and is the highest ratio in the stone & epoxy flooring industry. The above, combined with our tested and proven steps below, are needed to deliver on our number one priority, Customer Satisfaction! comfort and safety our customers expect and deserve. 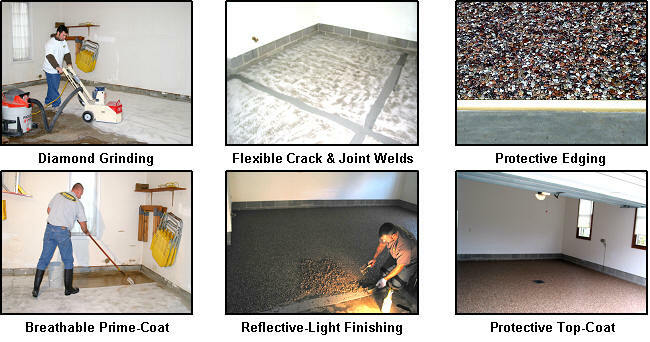 Proven steps to ensure that you receive the Highest Quality floor available today! Diamond Grinding - Ensures an extremely tenacious bond to the existing substrate. Flexible Crack Welds - Helps to prevent existing substrate cracks from reoccurring. Protective Edges - Helps to prevent high-traffic edges from chipping. Breathable Prime-Coat - Provides a 100% bond and ensures that the floor will not delaminate. Solvent-Free Trowel Slick - Emits NO hazardous fumes or odors and does not weaken the floor. High-Strength Top-Coat - Keeps the floor from shedding and provides gloss retention. Ultra-UV Top-Coat - Helps to provide extended gloss retention on exterior installations. Small Stones are best for basements, patios rooms, indoor swimming pool decks and other areas that need to be user friendly. Small stones create a beautiful " tight-knit" and extremely durable floor that is easy to clean and very comfortable to walk on. The only drawback to a "small stone" installation is that the installing contractor must have highly skilled finishers, that care about what they are doing. If not, unsightly trowel marks will be left on the floor. Competitors that try to steer you to "large stones" for interior floors are generally trying to get by with low-paid, unskilled labor. They know that large stones are much easier to install. Unfortunately this "lack of concern" is permanent for the unsuspecting homeowner who winds up with a garage floor or exterior patio stone in their living room! Large Stones are very decorative and durable. They are more suitable for exterior applications such as: garages, patios, sidewalks and driveways. Large stones have much better slip resistance and tend to wear better, under high traffic. Large stone also install much quicker and can be useful in areas where a large amount of square footage needs to be installed in a shorter time. but refuses to put it in writing......beware!